Whether you’re exploring the paths around Castle Rock or trekking through the mountains, there are certain things to watch out for, so you can keep your dog safe. You’d think we’d lead with something epic… like mountain lions! But no, we’re starting with grass seeds. Foxtails, to be exact. These seeds can be a pain for your dog, especially from July through October. Foxtails are grassy weeds that grow in native grasses. You’ll find them in the open spaces around Castle Rock, along local trails and even along Plum Creek. Foxtail seeds can be a hazard for your dog because they latch onto your dog’s fur or skin and work their way inward. The best way to prevent foxtail seeds is to keep your dog out of uncut grasses and weeds. After a hike, always check your dog’s ears, nose and paws for seeds. Because Colorado has such a dry climate, our weather can be deceptive. If you’re out hiking with your dog, it may seem like you aren’t even sweating! It’s important to know, though, that dehydration and heat exhaustion are both real risks for your pup. Dogs cool off through panting… and panting causes them to lose moisture. 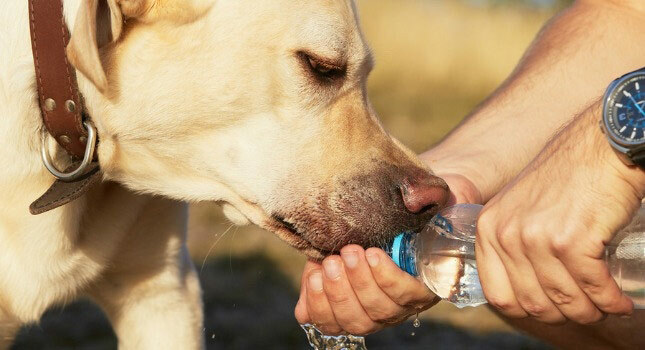 Here’s what you can do to help keep your dog hydrated and rested. No matter how tough your dog’s paw pads are, pavements can burn — even on 70-degree days. And rocky trails and open spaces offer hazards for your dog’s paws. The good news is there are things you can do to keep your pup’s paws in good shape. Colorado doesn’t have nearly as many insects that affect dogs as in other parts of the country. But if your dog is forging trails through the woods or grassy areas, your dog may encounter a tick. Leptospirosis is a bacterial disease that can affect dogs and people. Our vets see the most cases of it in the summer and in the fall. Leptospirosis is spread through the urine of infected raccoons, skunks, livestock, rats and other animals. Keep your dog’s vaccinations up-to-date, and keep your dog out of streams and stagnant water. You’ll go a long way toward keeping your dog healthy! And finally, we end where we almost started: wildlife encounters. Wildlife tends to be most active at dusk and dawn, rather than during the day. And many of our Castle Rock hiking trails have decent, daytime foot traffic on them. So the good news is, you may never run into wildlife. 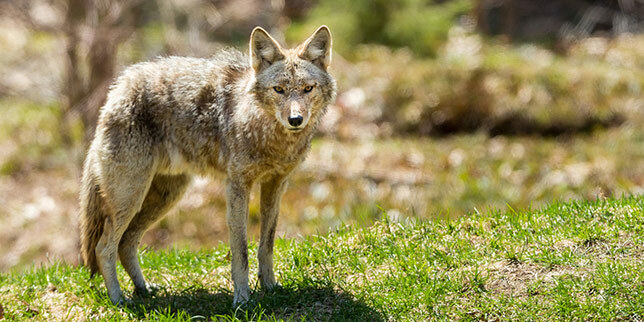 With that said, it’s best to know what to do if you and your dog do encounter a coyote, mountain lion or something else. Use these tips to prepare for fun hiking experiences, and you’ll be in a better position to keep your dog happy and healthy.